Shop Knowledge center Crop rotation How do you pull in AC-film? AC-film stands for anti-condensation film. This is processed film that ensures that the created condensation flows out over the complete surface of the film. The moisture doesn’t attach itself to the foil, which ensures a low amount of drips, this in terms means that drips don’t end up on the crops. 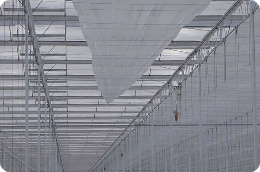 In recent years the vegetable cultivations make more use of the AC-film at the start of the cultivation, to create a warmer greenhouse climate for the younger plants. AC-film causes a lower loss of light when compared with the moving screening installations. With purchasing and applying the AC-film u should take into account some attention points. Our specialist will set up these points for you. The first step when purchasing AC-film, is determining the desired width of the film. This is dependable on the greenhouse dimensions. The rolls of AC-film can be delivered in different standard widths: 175 – 200 – 250 – 330 – 350 – 425 – 480 – 530 – 580 – 680cm. Keep into account that there has to be a small overlap between the different lanes, so that you can staple the film together afterwards. Therefore, you should ensure that you have at least 5-10 cm extra. Please don’t forget to order an extra 2 meters of film for both sides of the greenhouse. As the crops grow bigger, more moisture will arise in the crops. To ensure that this moisture is drained properly, we recommend to equip the AC-foil with enough perforations. For tomatoes they regularly use the 5x5 centimeter punch pattern. For peppers and cucumbers this is usually 10x10 centimeter. You could also choose for a variable punch pattern. To hold more heath alongside the cold facades, you could choose not to punch the film at all for the first and last 10 meters. For suitable advice on this matter you could always contact our specialists. The AC-film shall have sufficient sag at the point between the tube, so that the condensate drops to the lowest point of the film (i.e. between the tube), can fall down and does not end up on the crop. To do this apply crop wires to above the cultivation gutter on the lower lattice girder. Make sure that the film can rest for about each 160 centimeters in a wire bed. When you are ready to pull in the AC-film, it’s very important that you use the correct twine. When pulling in the AC-film a high amount of force is put on the twine. Therefore, you will need to use a thick and strong twine with a high breaking force. A suitable twine for this is, is Gripolen. Make sure that the twine is properly fastened onto the film. Roll the foil in a funnel and fasten the twine firmly, this to make sure that it won’t break lose during application. When you use the single-sided AC-film, it is very important that you pay close attention to the way you pull in the foil. The side with the AC-function has to be on the bottom. When you use a double-sided AC-film, you don’t need to play attention to this: then both sides of the film have the AC-function. The first time that you pull in the AC-film, use a pipe rail trolley to lift and lay the foil over the crop wires. In this case , attach a twine to the end of the film. When you remove the film after a couple of months, you automatically pull the twine over the crop wires, therefore there is no need for a pipe rail trolley when pulling out the film. This in terms makes this process a lot easier. Pulling in the AC-film can be done both manually and mechanically. However, manually pulling in the AC-film is a very hard and labor-intensive job. Therefore, many companies choose for pulling in the AC-film mechanically. After you pulled in the film, staple the AC-film lanes together. When you staple the lanes of film together every meter, you prevent cold air from getting under your film. When you staple the film please make sure you keep the 5-10 centimeter overlap. For stapling you can use a simple stapler. When you have questions regarding the purchase or pull in of the AC-film, or you would like advise? Please contact product specialist Crop Rotation Martin Meuldijk, or ask your questions in the form below.